CLICK HERE for the podcast outline. Laura Monaco Torelli is the founder of Animal Behavior Training Concepts in Chicago, Illinois. She began her career in 1991 at Chicago’s Shedd Aquarium, where she trained beluga whales, dolphins, sea otters, seals, river otters, and penguins. She has also worked at the San Diego Zoo and then Brookfield Zoo as a lead supervisory trainer. 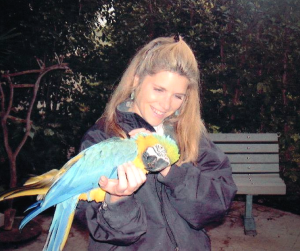 During her time in the zoo community, Laura worked with a wide variety of terrestrial animals, including primates, large cats, birds of prey, horses, parrots, tree kangaroos, giraffes, red pandas, and dogs. Laura now serves as a faculty member of Karen Pryor Academy, and as a Teaching Assistant for Dr. Susan Friedman’s Living & Learning with Animals online course. She and her team at Animal Behavior Training Concepts offer private in-home training as well as group classes at Medical District Veterinary Clinic, an extension of the University of Illinois College of Veterinary Medicine. Hop over to Hannah – (Listen to Laura’s Podcast on Hannah Branigan’s Drinking from the toilet podcast show). Laura and Santino TV appearance. That Rucksack Walk fella is a genius! !